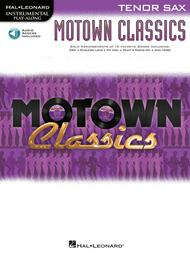 Motown Classics - Instrumental Play-Along Series (Tenor Saxophone). Composed by Various. For Tenor Saxophone (Tenor Sax). Instrumental Folio. Softcover with CD. 24 pages. Published by Hal Leonard (HL.842575).ISBN 1458405591. 9x12 inches.15 favorites from legendary Motown acts like the Supremes, the Jackson Five, Marvin Gaye and others, arranged for solo instrumentalists: ABC • Ain't No Mountain High Enough • Endless Love • How Sweet It Is (To Be Loved by You) • I Just Called to Say I Love You • My Girl • Stop! in the Name of Love • The Tracks of My Tears • What's Going On • You've Really Got a Hold on Me • and more.